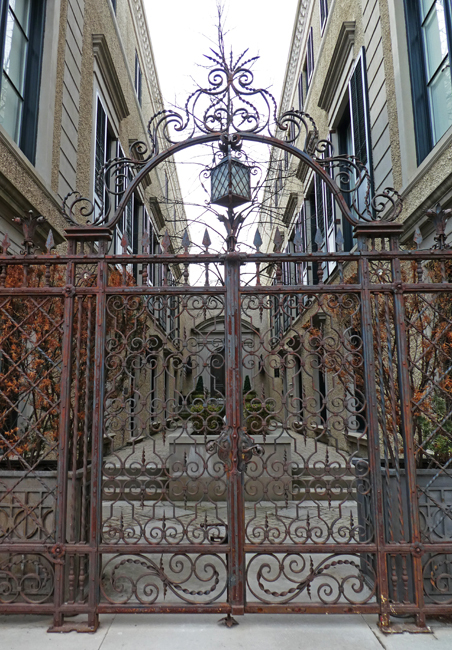 This gate is located almost directly across Yonge St from yesterday's pic and it leads to a courtyard that is very pretty especially in summer. The building is U-shaped and was in very rough condition until undergoing a huge renovation and restoration several years ago. It now has some commercial space on the main floor and exquisite residential in the rest of the building. Wouldn't we all like to have a tour? 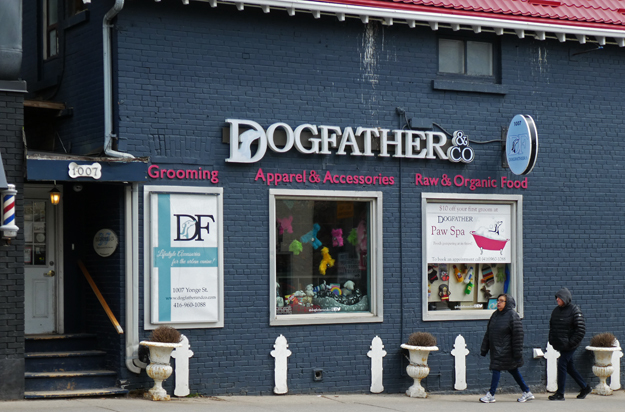 I spotted this dog store along Yonge St in one of the most upscale parts of Toronto. I'm sure there are a lot of lucky dogs from this neighbourhood who get presents and spa treatments here. That is a great name they have! 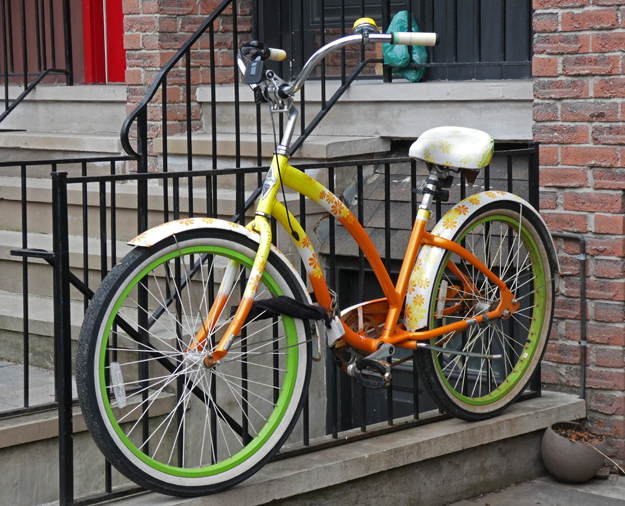 I spotted this flowery bike while out for a walk on the weekend and thought it was perfect for the season. And doesn't that seat look comfortable? We are back to Feel Good Lane for another mural. I love the playfulness of this one by artist Monica Wickeler. Coming home to this garage would make me smile every time! There will be several more murals from this lane on the Mondays to come. I spotted the first pansies of the season at a local garden centre. 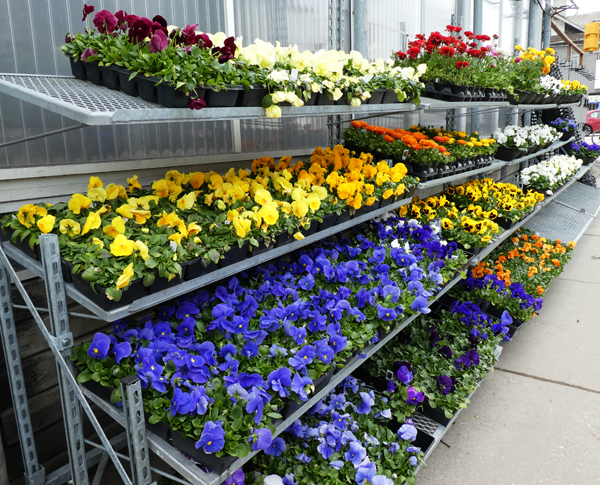 Pansies can survive a little cold weather so are always the first plants to appear in the spring. 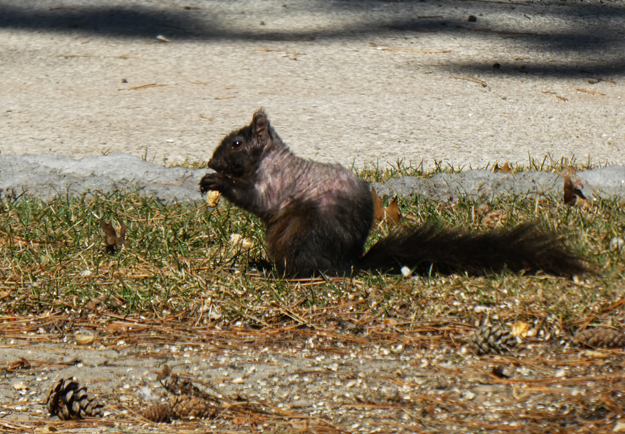 Spring is not the most attractive time of year for squirrels when they are shedding their winter coats and preparing for a nice new summer one. This poor girl had better hope that we don't get some very cold weather or she will be feeling the chill a lot! Last weekend we finally got warm weather and the spring flowers started to pop open. One of my favourites are the Scilla with their lovely blue colour. 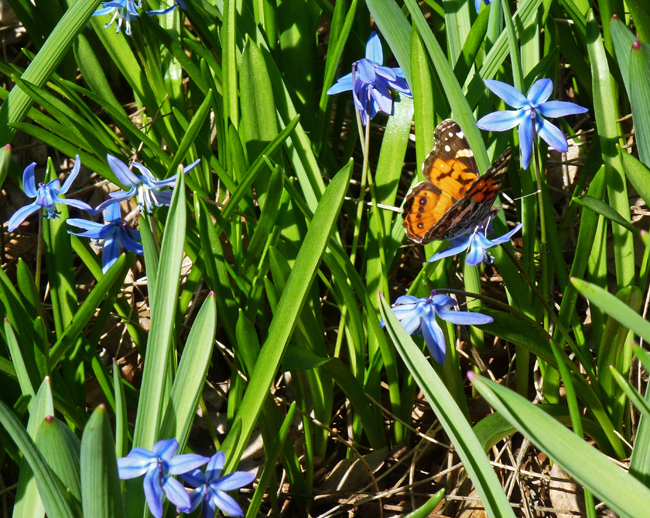 This patch had an American Lady Butterfly as a visitor! This is the lower part of the facade of the tower which was off to the left in yesterday's pic of the ghost sign. 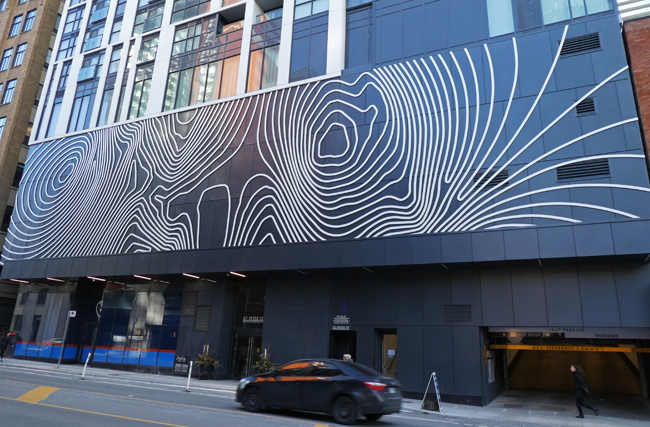 This is a new tall condo tower and as part of new construction in the city there is a requirement for a certain percentage of money to be spent on public art. 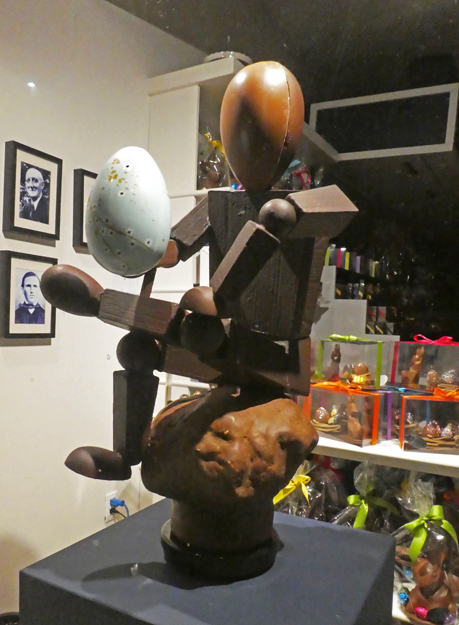 I could find no artist name for this one but did find a reference to it as being inspired by a topography map. It is likely that it lights up at night since this is the entertainment district which really comes alive after dark. I spotted this restored ghost sign on Peter St in the Entertainment District. 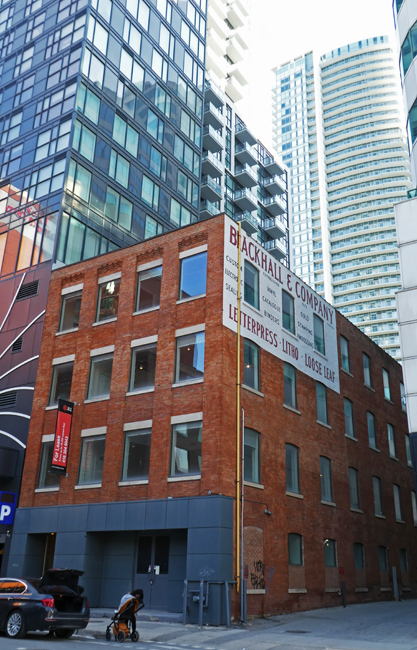 Blackwell& Company was established in 1873 and the original sign was on the building until 2015 when an extensive restoration of the building included renewing the sign. I think the building now houses offices and studios but I'm not sure. 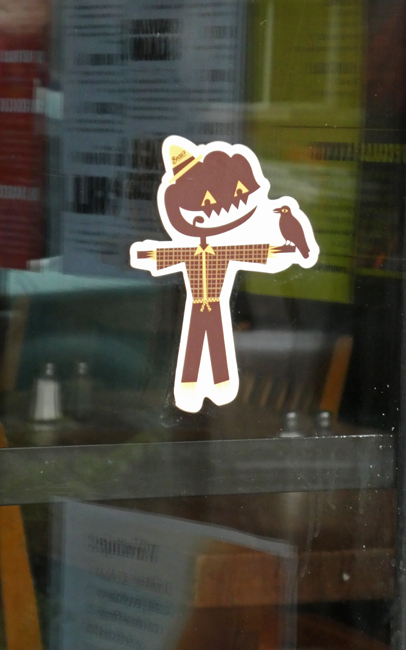 I spotted this cute scarecrow with the pumpkin head on the door of a pub along St Clair Ave W and took the pic because I liked it but couldn't figure out why it was there. When I got the pic up large on the computer I could see that the hat has the word Beau's on it which is a local craft brewery. It turns out this little figure appears on the label of an autumn brew called Weiss O'Lantern, a pumpkin flavoured Weiss. I'm not sure about pumpkin flavoured beer. 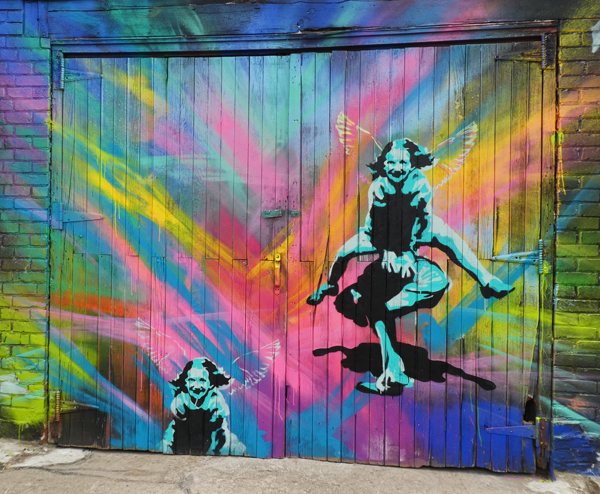 This is the first of the murals from Feel Good Lane which I will be showing you for the next several weeks. The artist for this one is Frannie Potts and she has done a wonderful job. I love the colours and the style! 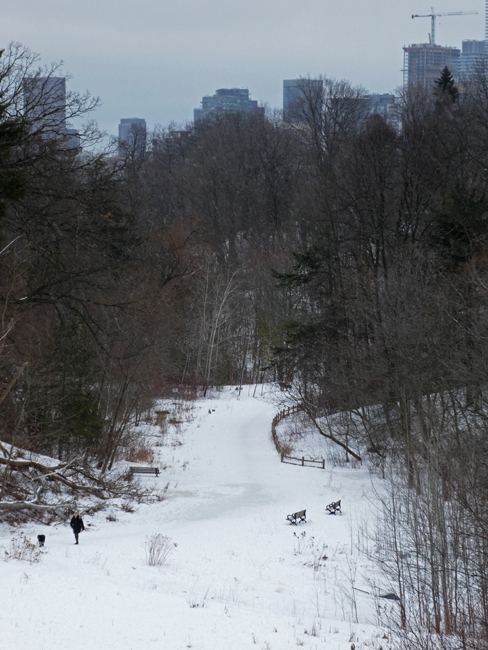 Last Sunday Toronto woke up to a surprise snowfall which continued on and off through the afternoon. 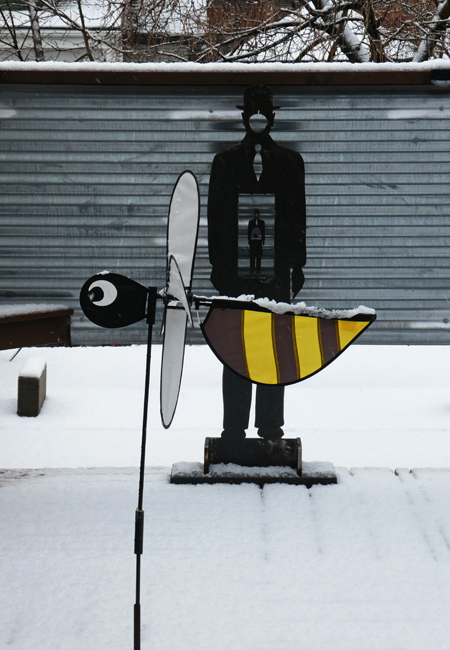 Frosty had left his post on our roof deck and handed duties over to Bob the bee but Bob was not expecting to be snowed on. That man continues to lurk in the background and our weather has warmed up a bit this week. 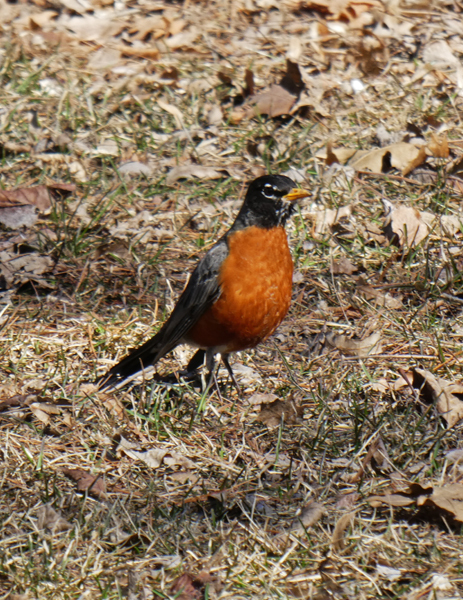 I've heard a few robins around and spotted some from a distance but this is the first one that I have seen poking about in the grass for goodies. He certainly kept an eye on me and the camera before flying off into a tree. 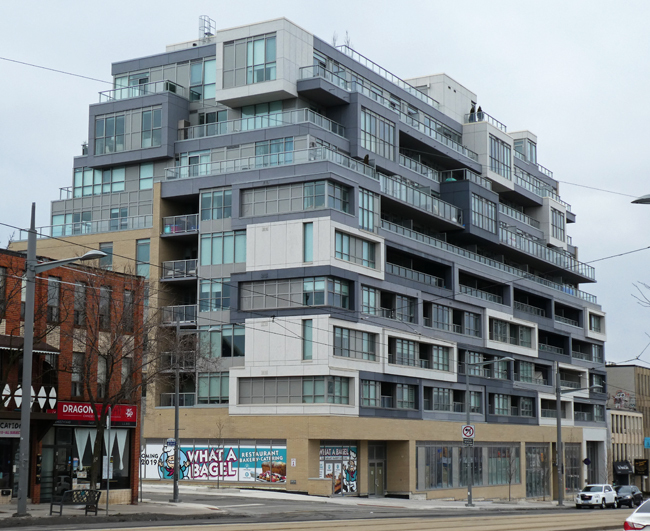 This condo building has been recently completed and people have been moving in. 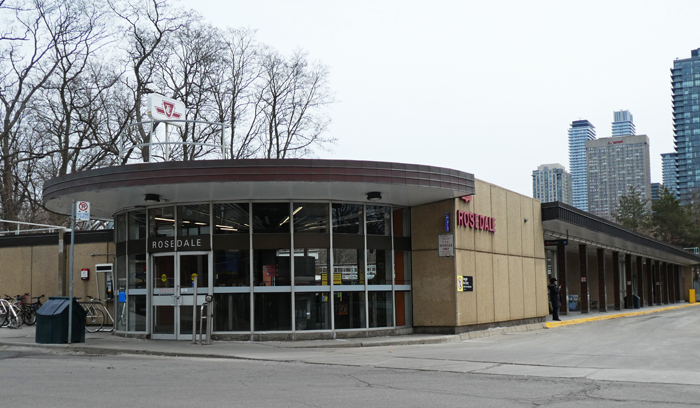 It had replaced some uninspired commercial buildings along St Clair Ave W and looks to be a nice addition to that neighbourhood. I like the design a lot. It will be interesting to see it when the commercial spaces on the ground floor are filled. 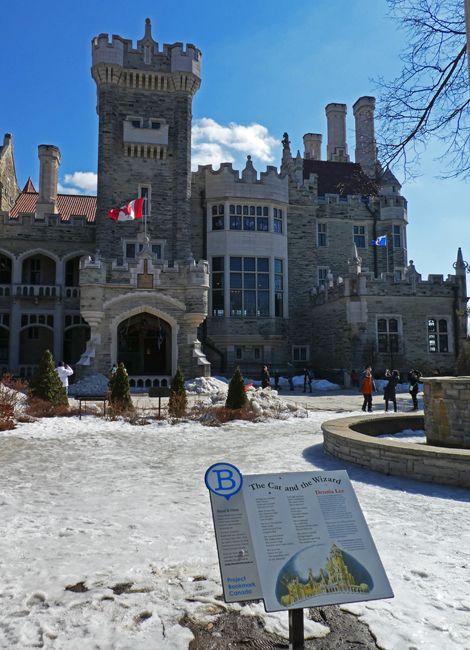 Yesterday's Bookmark was located out at the front entrance to Casa Loma which features in Dennis Lee's poetry. We don't have any snow and ice now but a couple of weeks ago I had to walk gingerly across the ice to get this pic. I spotted another of the bookmarks erected by Project Bookmark Canada, this one the first children's bookmark. 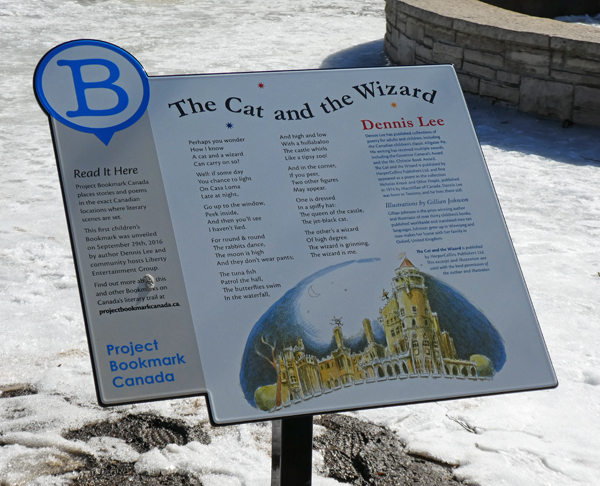 It was unveiled in 2016 and is The Cat And The Wizard by Dennis Lee who is a Toronto author well known for his children's poetry. I'll show you the location tomorrow. 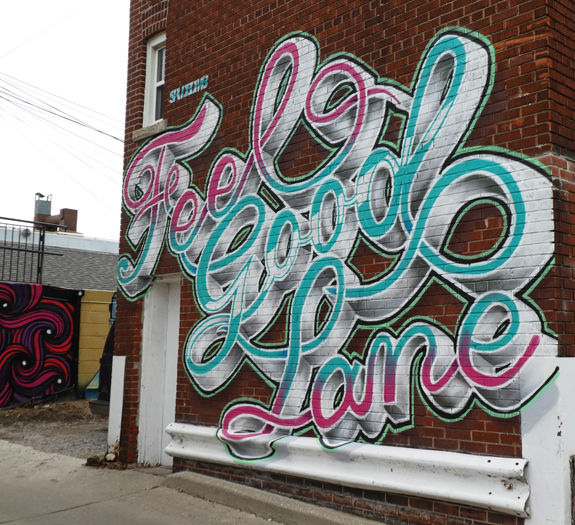 A week ago I explored a laneway in mid-town that is called Feel Good Lane, named after a local rapper who performed under the name "Feel Good". His real name was Barry Luksenberg and he was killed while motorcycling in Viet Nam in 2014 and the lane was named after him in 2016. 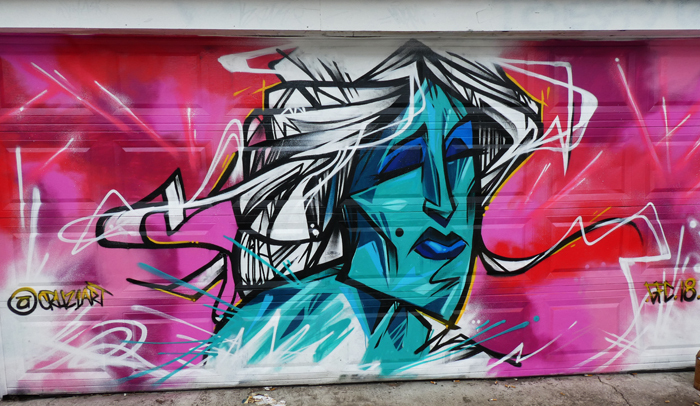 Last fall a large group of artists painted murals on garage doors all along the lane and I will show you some over the next few weeks on Monday Murals. Taking part in Monday Murals a day late. 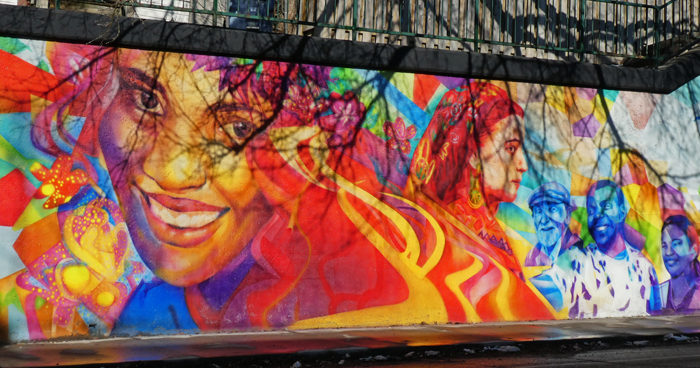 Click HERE to see more murals from around the world. 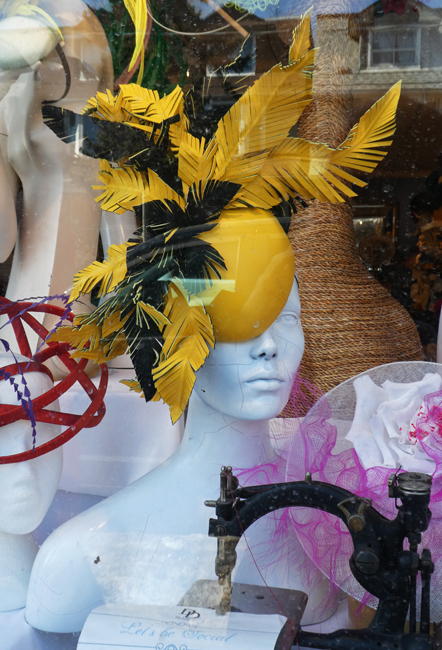 The April theme for the City Daily Photo Blog community is Yellow and I offer this wonderful yellow hat as my choice. 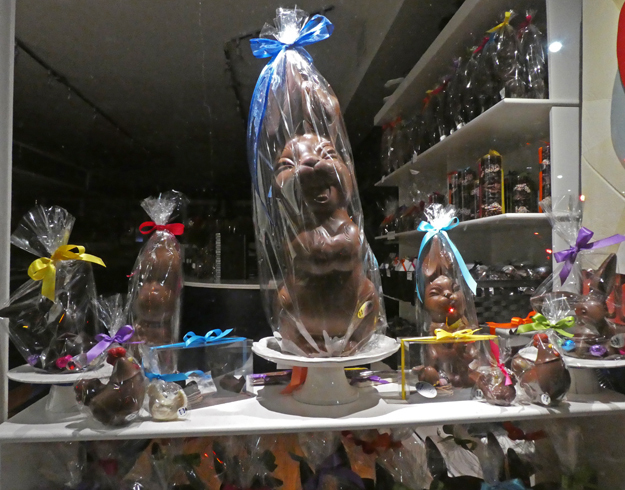 It would perfect for Easter which comes on April 21 this year. And I like the old sewing machine in the front of the window display where I found this one. Taking part in the theme Yellow. Click HERE to see more examples of yellow from around the world. 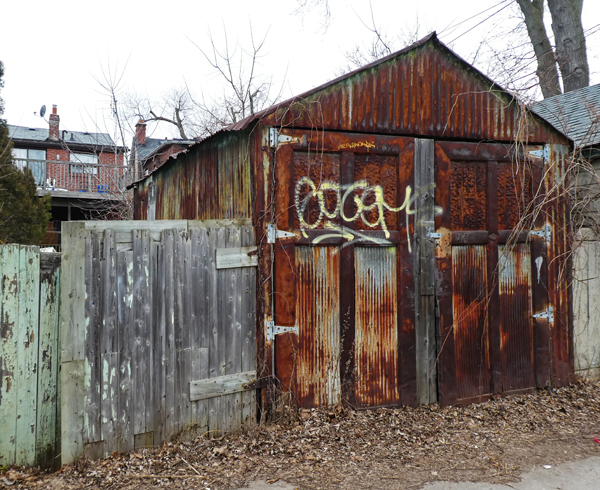 This garage looks quite old, probably older than the house that it belongs to as you can see in the background. I love the textures and the warmth of the rust. 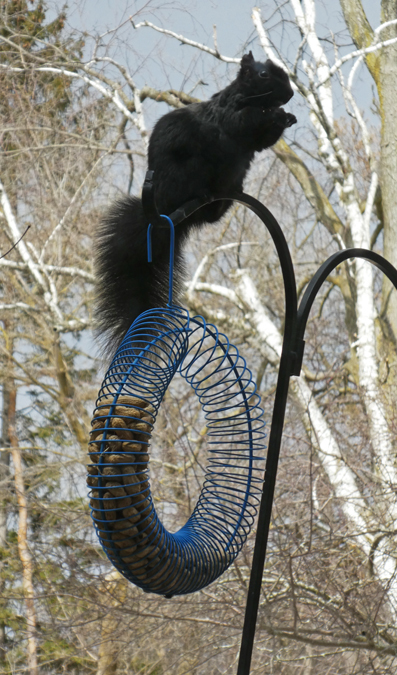 Every once in a while the kind people at the Veterans Centre at the Sunnybrook Health Sciences Centre put up this peanut feeder to give the squirrels a treat. This particular squirrel seems to be the matriarch of the group and she sat there eating away for a long time even though others came along and tried to get one. 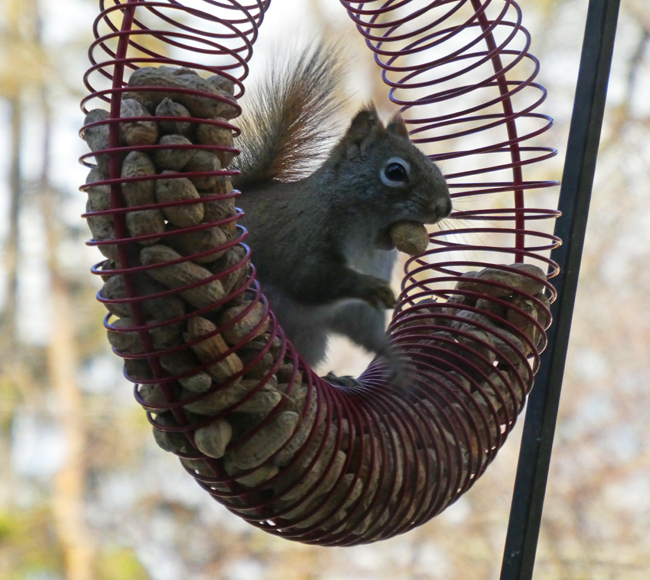 They had to wait until she finished and left before they could take turns getting a peanut. You can see that her coat is a bit ratty as it is time for the summer coats to start coming in even though it is still a bit cool here. 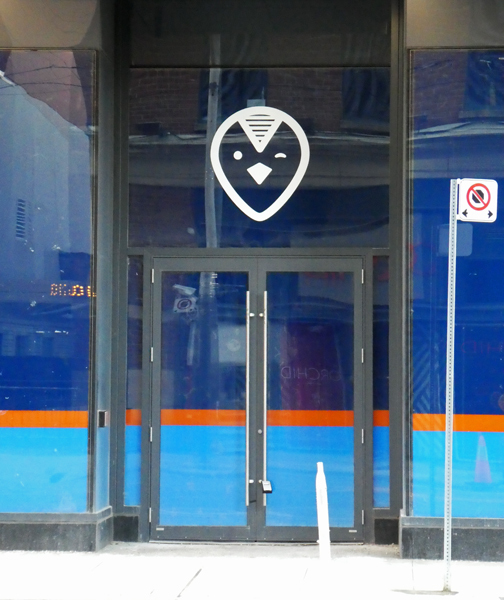 I spotted this logo above a door downtown in the entertainment district but could find no information about it at all. It looks like a bird to me and I wonder if it is the entrance to some kind of nightclub that doesn't need to have a sign - if you don't know about them then you aren't moving in the trendy circles. I do like the logo though. 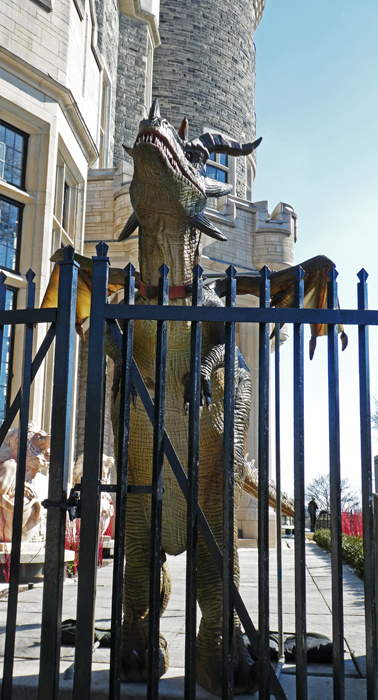 This is one of the dragons who were inhabiting Casa Loma and its grounds during the Imagine Dragons event. Most of them were inside the building but this one out by one of the gates was really popular with people taking pictures. I had to wait for him to be alone to get this one. 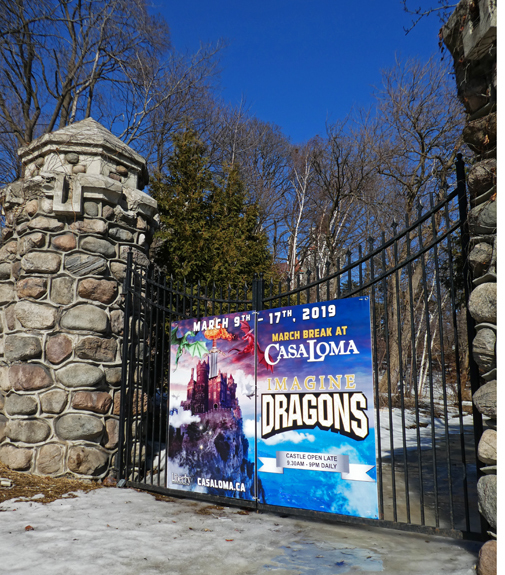 Our March Break for the school kids was a couple of weeks ago and Casa Loma ran a special event called Imagine Dragons for the kids. There were dragon figures, circus acts, bouncy castles and lots of other things to enjoy. I happened to go past that week and the place was buzzing with families going in and out. This sign was on the lower entrance into the gardens which isn't used in winter. I spotted this lovely doorway along Adelaide St in the historic downtown area of the city. 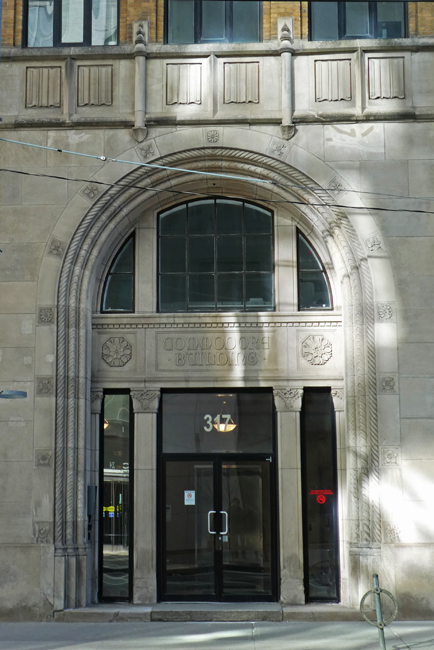 It is hard to read but in the stonework above the door it reads Commodore Building. The Commodore was built in 1929 as a commercial warehouse but now is divided up into offices serving those in the creative fields such as architecture and advertising. I love the nice Deco carvings in the stonework. 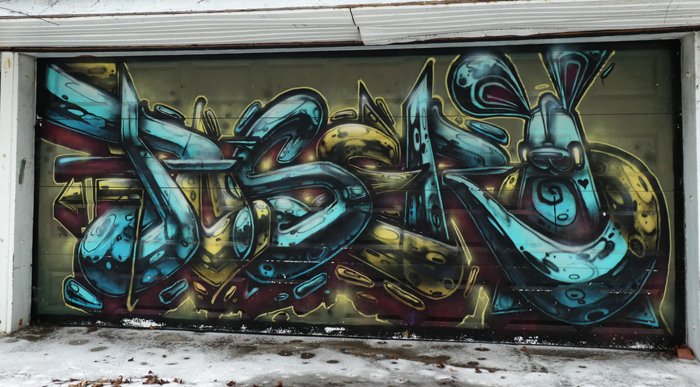 If you look carefully you can see one of the artist Poser's bunnies on the right side of this garage door. The other metallic streaks are spelling out the name Poser. The whole thing reminded me of those metallic balloons that you can buy for special occasions. I took this pic a couple of weeks ago just as all of our snow was starting to disappear. 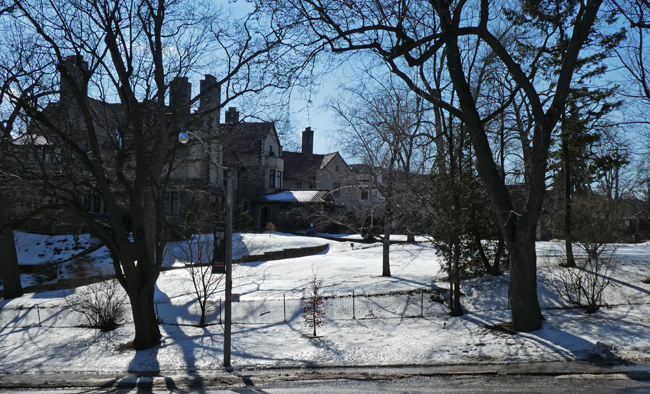 Throughout most of the year this home across the road from Casa Loma is fairly hidden behind leaves as you can see in this pic (HERE) taken last May. 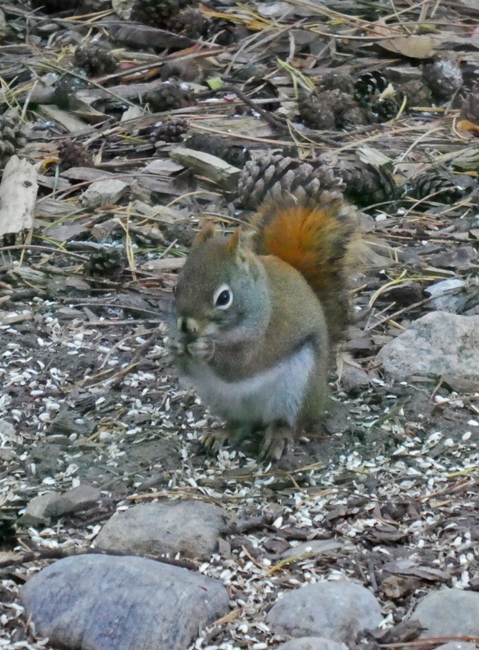 I spotted this red squirrel out on a day when the snow was starting to disappear. I hadn't seen one of these guys since our deep snow arrived. 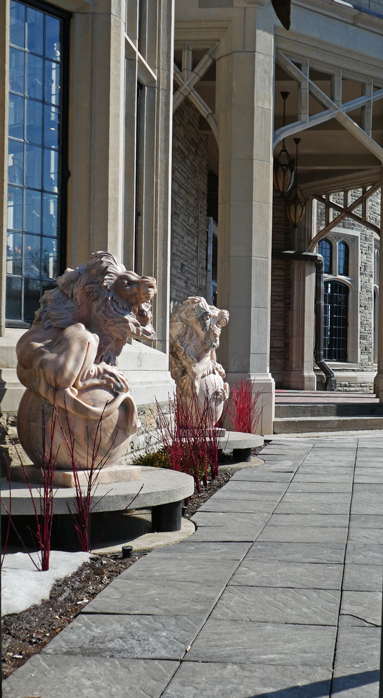 No one gets past these large cats outside one of the entrances to Casa Loma without a little inspection. They have a nice sunny spot to sit even on a winter's afternoon! I took this pic about a week ago when we still had a lot of ice and snow around and had a wonderful winter sky as a background. 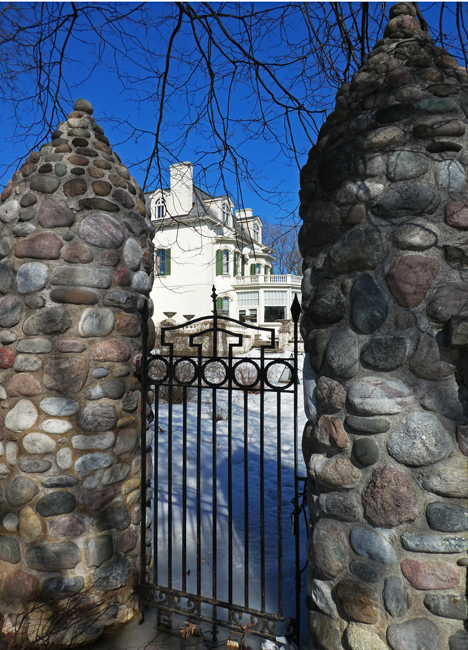 This is a view of Spadina House through one of its gates which aren't used at this time of year. Happy Spring to all of us northerners! Cannabis became legal in Canada last year but in Ontario the shops selling it will not be opening for another month and up until then it is only available by mail order. 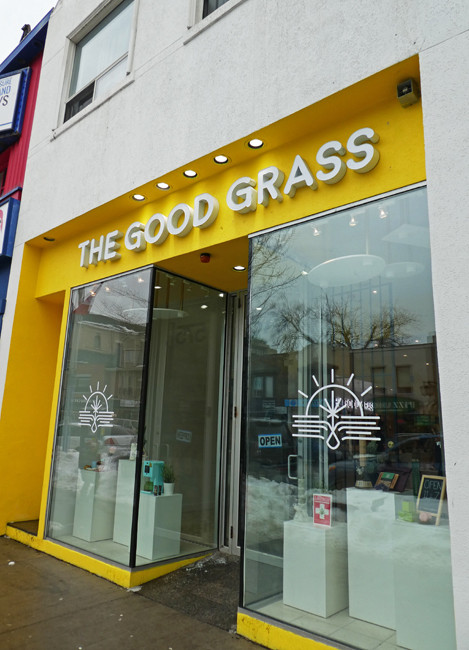 The Good Grass shop opened this winter on Danforth Ave and they intend to provide "a new & refreshing experience for the contemporary Canadian cannabis user". I didn't go in but assume they offer a lot of accessories at this time. I like the look of their storefront. 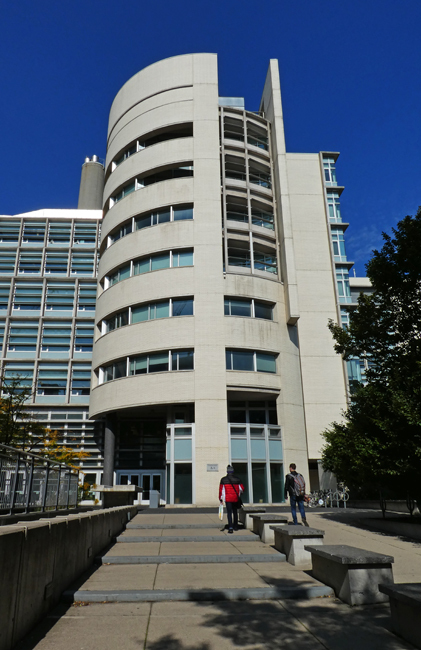 This is the rear entrance to one of the engineering buildings at U of Toronto. It looked quite dramatic on a crisp fall day last October. 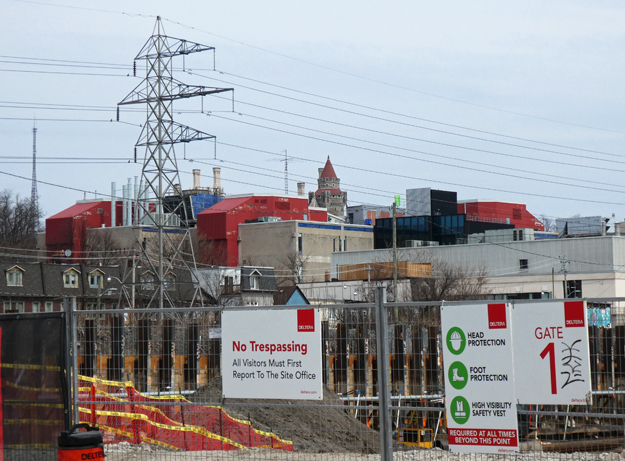 You can't see it in this pic but during the summer there is a channel by the fence on the left that has water running through it and babbling away to offset some of the city noise. This is another section of the long mural by artist Christiano De Araujo that I have shown you on the last couple of Mondays. 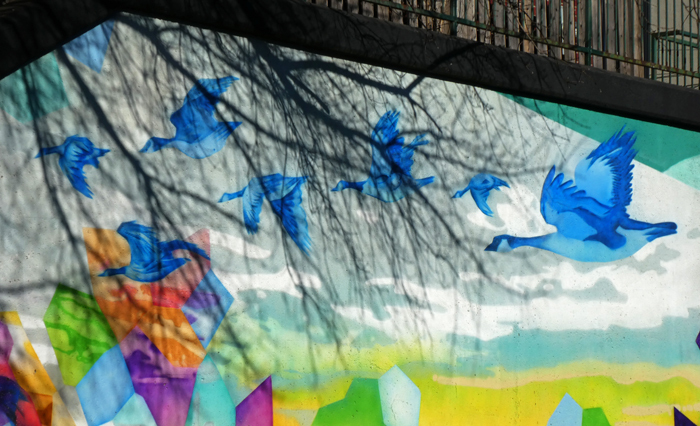 These wonderful geese fly towards the smiling faces from last week and the shadows from the tree above makes it look as if they are flying through some woods. I've never seen a blue Canada Goose before but it really works well here. Taking part in Monday's Murals. 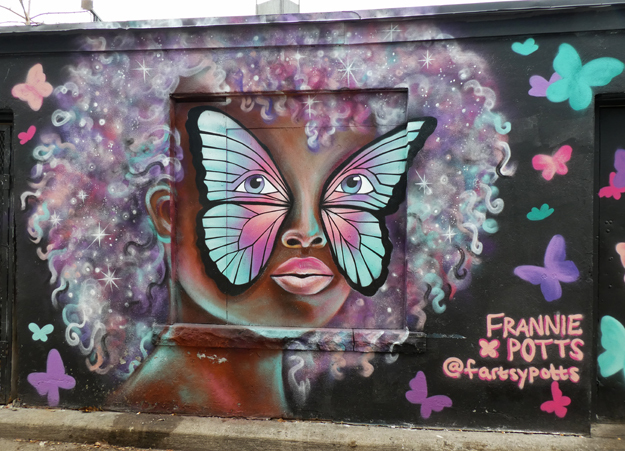 Click HERE to see more murals from around the world. Happy St Patrick's Day to everyone. Our St Patrick's parade was last Sunday but it was a miserable day and I had work to do so I'm using this pic that I took at the parade last year. 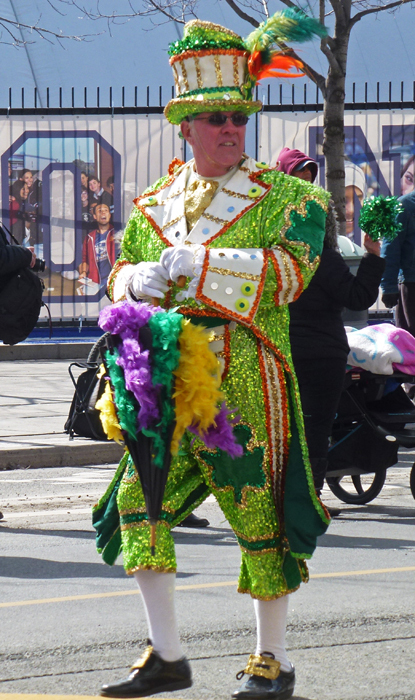 This wee leprechaun was having a grand time as he marched along waving to all of the kiddies! This pic was taken a couple of weeks ago during one of our mini blizzards that were so common this winter. 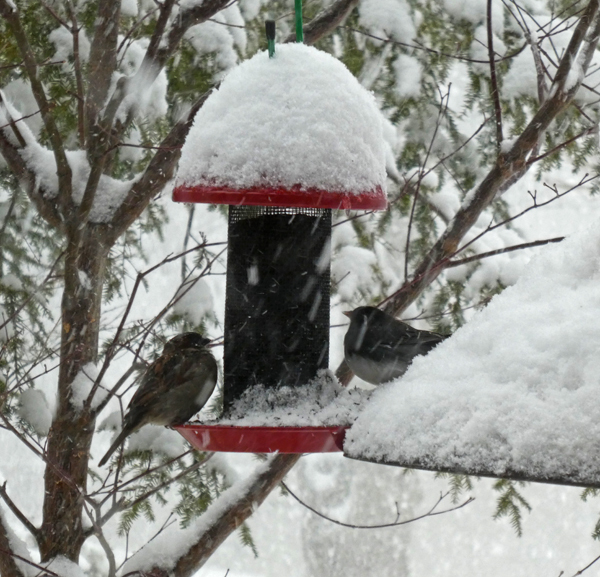 The Dark-Eyed Junco and the House Sparrow had managed to push some snow away and get at some seeds to help them keep warm! 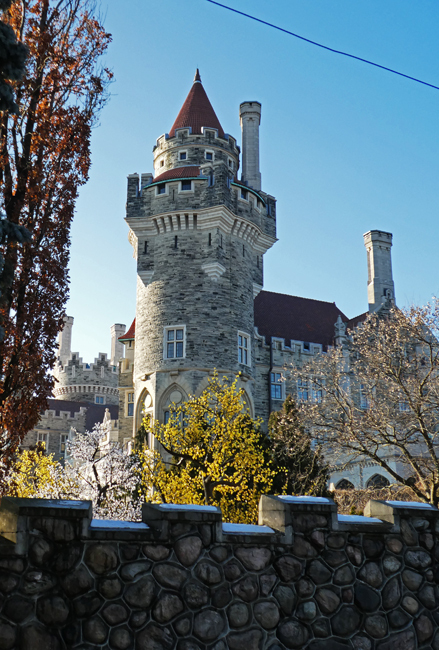 I showed you this same view of Casa Loma last October (HERE) and wandered by recently and noticed that they still have the artificial trees installed. Those yellow and white 'flowers' are actually lights on trees that they construct each winter and then remove so that an entertainment tent can be installed. After some snow storms you really have to keep an eye open on what is above your head. 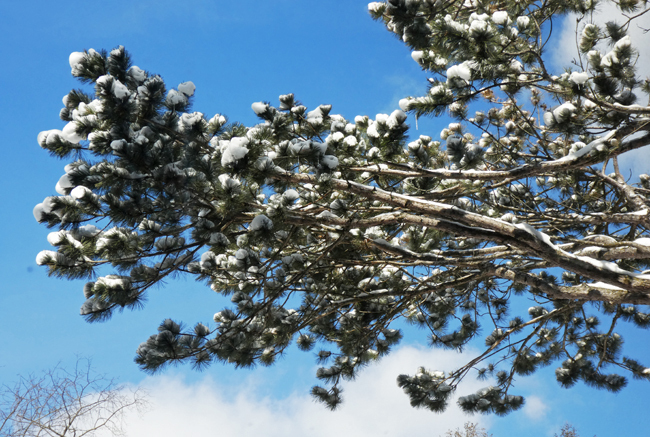 If the snow falls and there is little wind it will gather like this on evergreen trees and create big snowballs that later fall and soak you as you walk along. Pretty though! 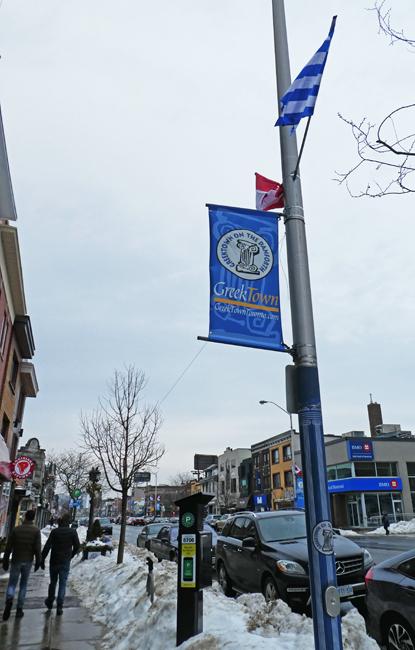 Toronto's Greek Town is found on the Danforth as this banner tells you. Even the lampposts have Greek stripes on them along this stretch of Danforth Ave. In the summer there is a huge festival where the street is closed and millions of people come out to eat and enjoy entertainment. 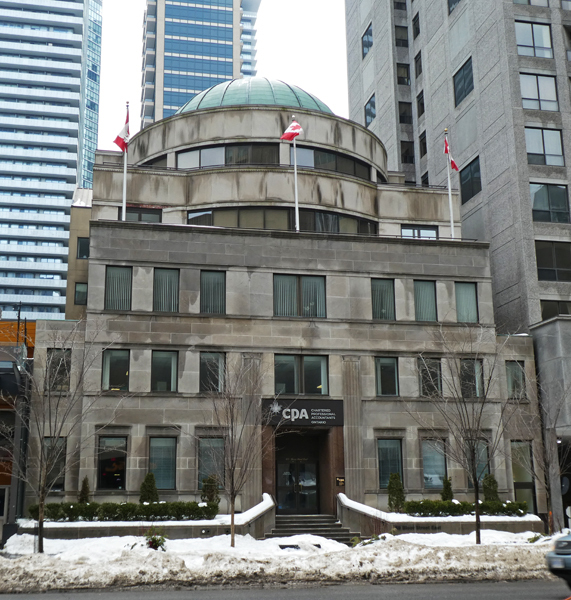 This building on Bloor St E was constructed in 1954 for the Chartered Professional Accountants of Ontario. I really tried to find out some info about the architecture but had no luck so can't tell you what goes on under that domed roof. Perhaps it is their library. This was taken just after another of our snowstorms so you can see all of the wet marks along the facade - winter is hard on us all! 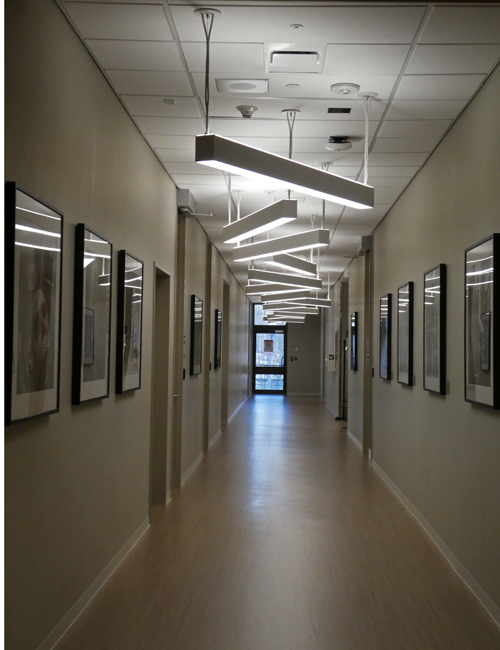 This hallway leads to the dental clinic at the Veterans Centre at the Sunnybrook Health Sciences Centre. I've always liked the whimsical way the lights were installed and finally caught the hallway empty of people. 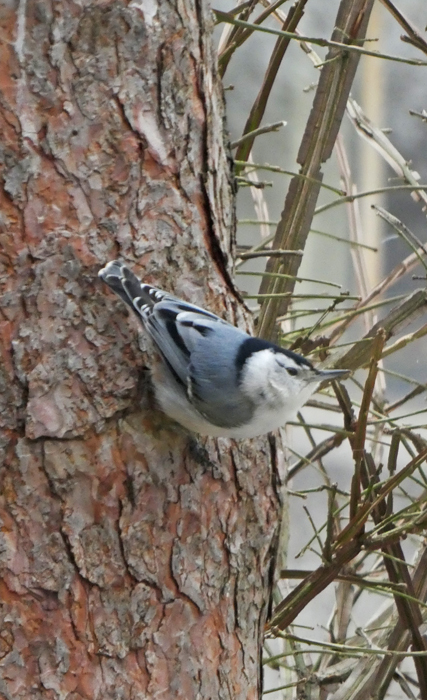 This seems to have been a good year for nuthatches and in particular the White-breasted Nuthatch. They are sweet birds who crawl up and down the trunks of trees quickly, then fly in to a feeder for one seed and then back to the tree. There is almost constant movement! This is another of the ravines that run throughout the city. 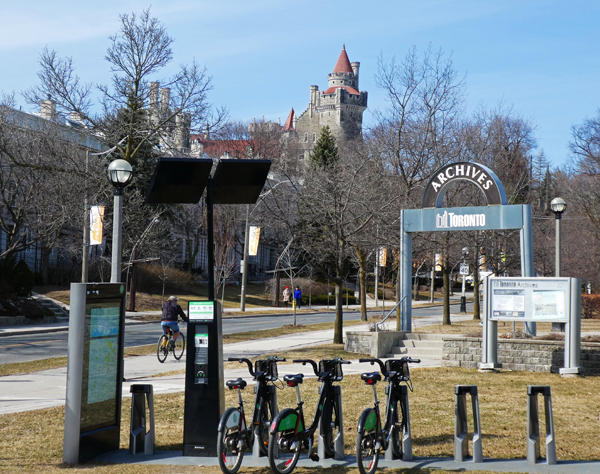 It is located just up the street from Casa Loma and is called Nordheimer Ravine after a family that had a large estate bordering the ravine many years ago. Castle Frank Brook ran through here but was covered over in the 1970s as many of the smaller creeks and streams were. Now this is a great spot to walk a dog or just go for a walk. 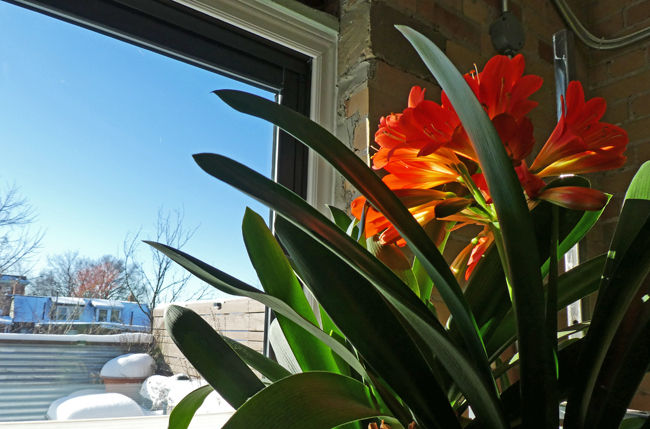 I took this pic last week when the Clivia flowered for the second time since Christmas offering a bit of colour to help make up for all of the snow you can see on the deck out through the window. We are all waiting for spring and the end of this snowy winter!